We recently completed a custom P Bass build and just received this fabulous response below. We take huge pride in our work and are delighted to have another happy customer. Thanks to you and all of the staff at Geary Guitarworks on the completion and delivery of my custom P Bass. It has exceeded my wildest dreams of what a custom built guitar could be. I knew that when I originally asked you to make me a bass that it was going to take some time, but I was honoured to be the first person to book a custom build from your new shop and was willing to wait. For myself it has been quite a journey, from finding the black walnut tree that needed to be culled, to then having you take the wood from the felled tree to then be milled. The drying process took quite a while, but I am convinced that it was indeed worth the wait. Once the wood had been cured and aged sufficiently, I was glad to be included in the ‘wood selection process’ where we looked at the available boards and selected a few that we felt could be used in the construction of a P Bass styled bass guitar. We selected pieces that we felt had interesting grain. The piece that was used for the body does look somewhat like a ‘baby rhinoceros’ as you had described it. You kept me well informed on the progress of the build, and I was able to view the progress on the build if and when I visited your shop. The finished product is a beautiful functional piece of art. The look of the wood grain is stunning. I had requested that the wood itself be featured in the finished product. To see a completed guitar where the body, neck and fingerboard were all fashioned from the same black walnut tree is amazing. Again in accenting the wood, the hardware mounted on the front of the guitar is minimal. The sound is spectacular. Your selection of a ‘boutique’ pickup from a relatively small manufacturer was right on the mark. I am looking forward to playing this guitar on the site of where the original tree had grown. This will complete the ‘circle game’/life cycle of the tree. Thanks again for all of your remarkable efforts. Feel free to include this note on your website as a testimonial from yet another satisfied client. I played my tele today and have to tell you its really terrific. Wow! Zack was over yesterday. He loves the sound and the action. The CBG building course I recently completed with you and Katie was an experience of minor magic. Being able to use my hands to make a musical instrument that works was such a pleasure that I have no choice but to continue doing it. Your instruction struck the perfect balance between providing necessary direction for the fundamentals and encouraging each novice builder’s creativity from the start. Your hands-on demonstrations and guidance on woodworking techniques gently drove away any anxieties an utter beginner such as I might have had. This was no “cookie-cutter” course, either. The CBGs that were made in my class were each stylistically unique. 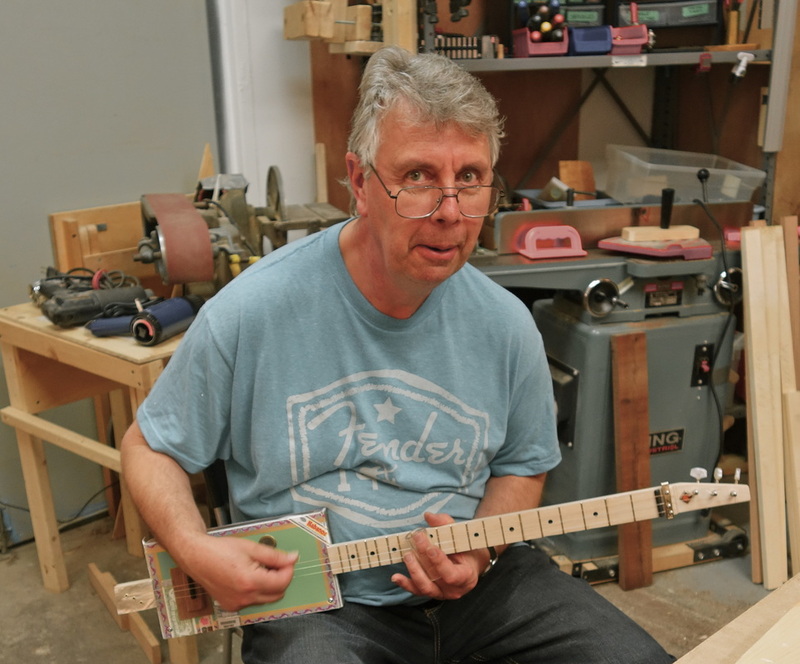 I completed my guitar build (CIGAR BOX GUITAR) on April 18, 2015. 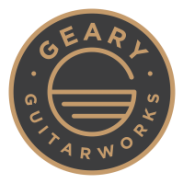 I was in the first class put on at Geary Guitarworks. I found the entire experience to be wonderful. The instructors were very knowledgeable and friendly. They were open to any suggestions that I had regarding design input on the guitar design. I was able to successfully assemble and hand craft my own CBG. I was very pleased with the results and my family were amazed that I was able to complete building a guitar on my own. The final product sounds great! Thanks for the opportunity to re-learn working with both hand and power tools. I put The Blues on the shelf with Do It Yourself ! Excitement has reached a fever pitch here at the Guitar Building School as we prepare to open our doors for the first Cigar Box Building Course this weekend. Yup, it’s humming around here. Hardware and electronics are flying in by aero postal. The gang saws are screaming as we pump out barrels full of neck blanks. Really cool Ossington chefs are going over final menu concepts for the included light lunch. Already, in a truly touching display of support, Cigar aficionados have dropped off more boxes than we can possibly handle. Well there is much still to do so I had better sign off. Hope to see you there.